Of all the beautiful varieties of koi that have been developed over the years, to me the Ai Goromo takes the prize as the most amazing accomplishment by the breeders of Japan. 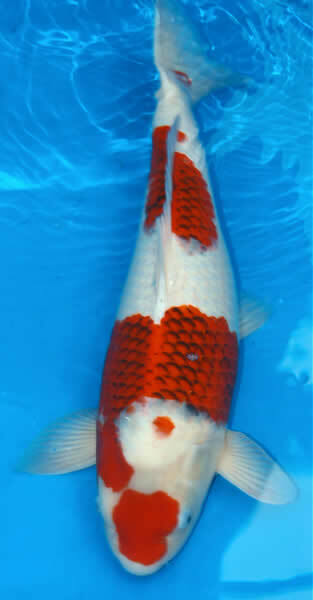 Ai Goromo is easily recognized by the delicate blue edging, or reticulation, on each red scale on a pattern of what would otherwise be a kohaku. Its cousin, the Goshiki, is an interesting contrast with its typical blue edging on the white. These two varieties are frequently combined as a single variety for koi show purposes. Two sub-types of Goromo, Sumi Goromo and Budo Goromo, are not as elegant or refined in appearance, and consequently don’t generally compete very well in shows against a good Ai Goromo. Sumi Goromo has a much darker and heavier edging, and the Budo Goromo has “grape clusters” (translation of “Budo”) mixed in with the normal reticulation. These two sub-types can sometimes be mistaken as shiro utsuri (black and white koi) due to the dark ai (blue) almost completely covering the red, but if you look closely you will see the red appear as a dark purple thru the almost black pattern. Ai Goromo was probably developed by crossing an Asagi with a Kohaku. 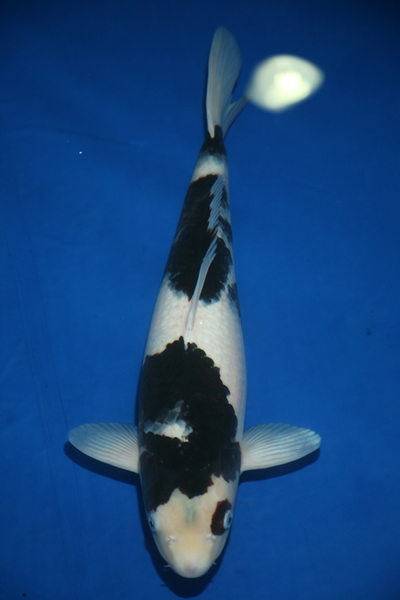 As a result of this cross, the Ai Goromo inherited a striking bluish-white background from its Asagi parent. 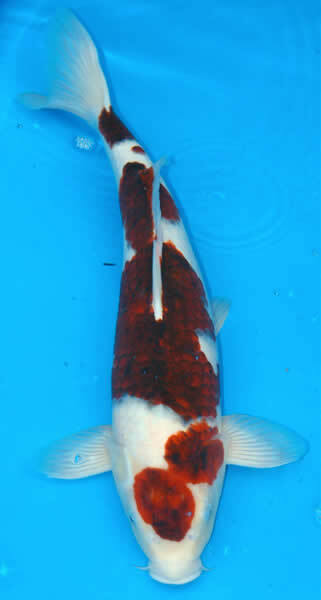 When selecting a young Ai Goromo, look for one with an attractive kohaku pattern and with reticulation that is barely visible if at all. This is why this variety is such a challenge to collect. You must be sure of the parentage, and even then there can be no guarantee that the reticulation will come, or that it will be even. The reticulation tends to darken and thicken with age, so if you buy a young (one or two years old) Goromo that appears to be a nearly finished Ai Goromo, the chance is very good that it will darken and become either a Budo or a Sumi Goromo. If, on the other hand, you are lucky enough to find one that develops into this most rare beauty, with each red scale outlined in a thin crescent-moon of blue, it will take your breath away. Happy hunting!